We’ve all heard the bad news about sitting. It’s the “new smoking,” as many news articles have put it. It’s been linked to upping your risk for cancer, diabetes, and early death, even if you exercise, according to recent research. It may even affect your mental health. But let’s face it: many of us have desk jobs, and there’s not much we can do about sitting at our computers unless we quit our jobs—or buy a fancy standing desk. The problem? These desks aren’t exactly affordable, with some of the more pricey models clocking in at upwards of $500. But, thanks to the ingenuity of the Internet and some smart product designers, there are now plenty of ways to stand more without breaking the bank. Here are our favorite DIY and budget-friendly desks that won’t cost you a small fortune. Emma Chapman, writing for the blog A Beautiful Mess, used pine wood and shelf brackets to build this standing desk suitable for any home office. She even added a bar stool for easy seating (when she needs a break). Check out her full tutorial. For those who aren’t as savvy with a saw, this stay-at-home mom placed an old door on top of two bar tables. (And voila!) For an even easier hack, opt out of finding a door (which can be tricky) and use a bar table alone for a workspace with the same height. This work-from-home business owner purposed a custom height standing desk using supplies needed to build a sawhorse, along with a countertop (costing just $99) from Ikea. 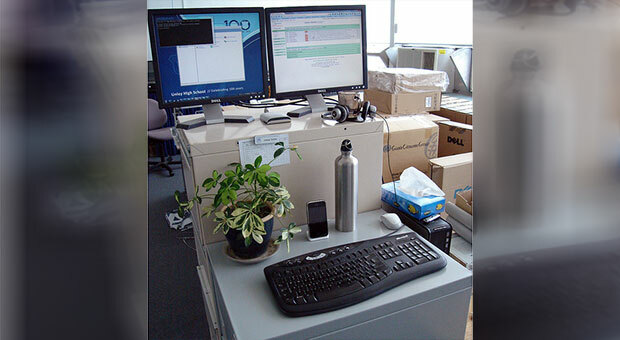 An easy way to add height to a smaller desktop is by using materials that are already in your workspace. This worker used boxes, but think about trying books as well (our food director converted her space using this method). 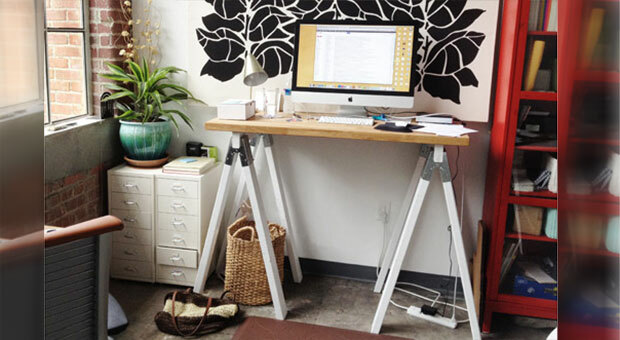 If you need a workspace with some extra height you can fashion a standing desk from a filing cabinet, like this blogger. If all else fails, a folding chair seemed to do this trick for this guy. Although, this makeshift workspace will leave you with limited space, and possibly some strange looks from co-workers. But hey, anything for your health, right? 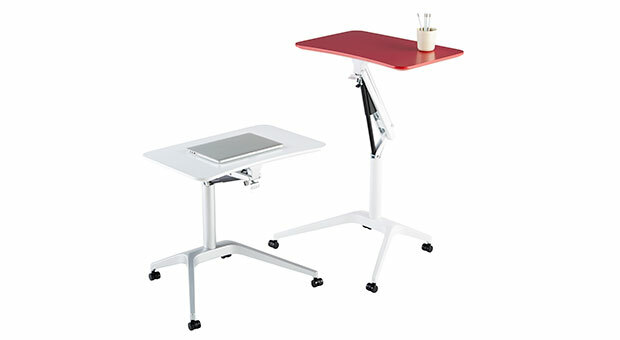 This adjustable workstation is an Amazon bestseller for a reason. 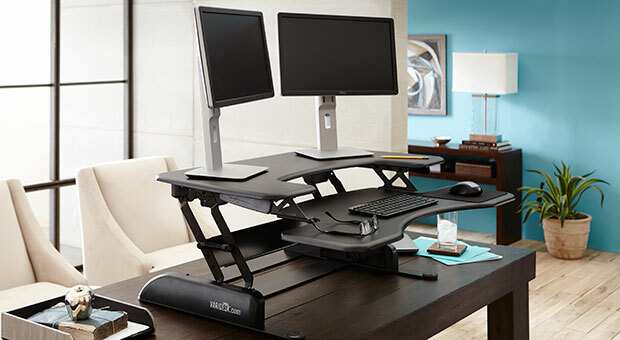 The VIVO Height Adjustable Standing Desk ($180; amazon.com) lets you easily switch from sitting to standing, and the dual tier design means you have plenty of space for both a laptop and desktop. Also good? It’s easy to assemble. Adjust your standing desk to any height with Ikea’s Bjursta Wall-mounted drop-leaf table ($35,ikea.com). When you’re done working, the space folds down into a small, space-saving shelf. 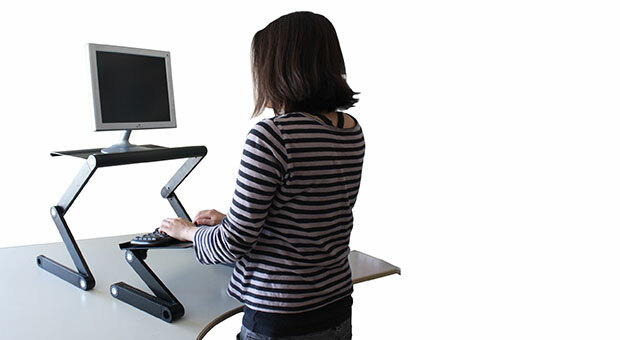 This standing deks from WorkEZ ($97; amazon.com) comes with a flexible monitor stand, keyboard tray and mouse pad that allows you to completely customize your workstation. In addition to easing hunching and back pain, the keyboard pad tilts downward to alleviate wrist fatigue. 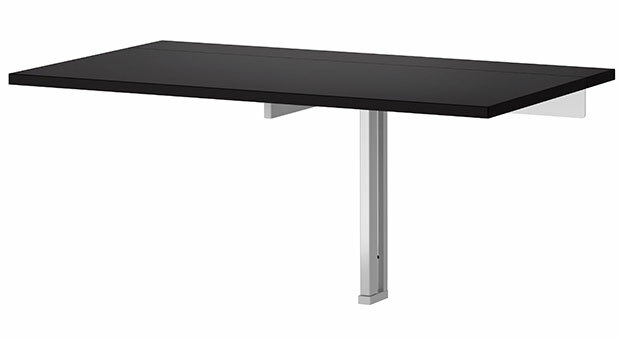 The Varidesk Pro Plus 36 ($395, amazon.com and varidesk.com) is perfect for those looking for a standing desk option that doesn’t skimp on space. The space is built to accommodate dual-monitor set-ups, allowing for a ton of space even for those who may not have two monitors. The two-tier design also offers plenty of space for a keyboard, mouse and other accessories.